Other than having a smaller growth habit, R. humilis also grows better in cooler climates than R. execelsa. Member of the Palmae (palm family). Relatives include many palms like date, coconut and oil. Fronds (fern leaves) are fan-like, forming clumps. Stems are covered with fibrous leaf sheaths. 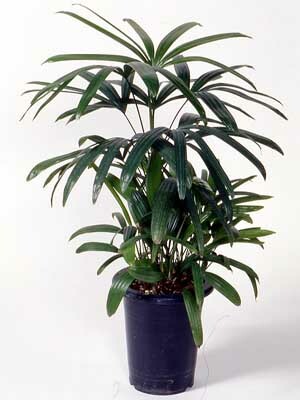 The specific epithet name “excelsa” means tall. Rhapis: Greek for needle but the application of this meaning to this species is not obvious other than in possible reference to the narrow leaf segments.